Strolling around our garden habitat definitely educates me on things I never knew, but of course, there's an unfathomable amount of information about the natural world that I don't know. 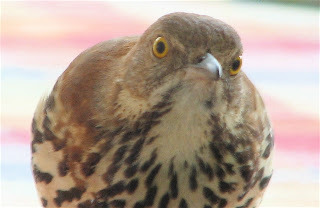 A week ago, I was watching two Brown Thrashers bobbing about with the male singing to the female. I was fondly remembering the day in 2007 when a male Brown Thrasher appeared at the dining room window to romance ME early one morning. It was a very special time and one I will never forget. This pair were on the front walkway and all of a sudden I saw one of them dart after a skink. I was really surprised and instantly thought it surely wasn't interested in eating it. I heard it chasing the skink through the flower bed. There's a stump on the other side of the bed that many lizards and skinks run to for cover and I guess this one made it to home base without the Brown Thrasher catching it since I didn't see either of them with it. To be sure my thinking of this scenario was correct, I Googled when I got back in the house and did find that Brown Thrashers have taken green anoles which are very similar to skinks in size and texture. Wow! Another nature fact added to my thinking cap. 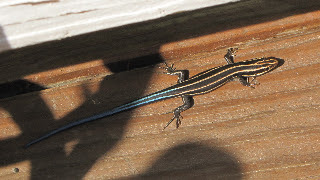 Here in our Central Virginia habitat we have the Five-lined Skink. The females retain the lines and their bright blue tail, but the male in adulthood is rather drab tan except for the bright orange head he displays during mating season. Learn more about skinks. 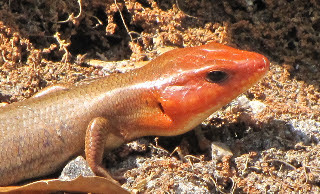 Read this previous blog post I did on our Five-lined Skink. One day I was walking around just looking for something interesting that was going on in our yard. As our wildlife habitat gets better and better, there's always something to enjoy! It really takes the punch out of life's circumstances when you can stroll about a garden with the Lord. Yes, it was a lot of hard work initially, but using native plants that take care of themselves now makes it 80% play time. As I walked past the area in front of the screened porch, the leaves were moving like there was something crawling underneath. I kept watching without a clue to what it was, but I kept hoping it would eventually stick its head out or come out entirely. My watchfulness was rewarded when I was bent down really low to see this long tiny snout come through the leaves and then quickly disappear beneath the leaves again towards the rear of the bed. I was excited. I figured it was a shrew. They eat lots of insects ... and they are eaten by snakes and raptors, of which we have. Speaking of snakes, I was in the front yard on the same day and the birds were in an area doing what is called 'mobbing.' It's when various species get together and scream their alarm calls while they fly near or at whatever the predator is. At least that's what they do for snakes. When the raptors are around they just disappear and are totally quiet! 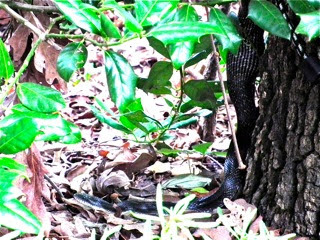 I looked around the tree where they were shouting and found a Black Rat Snake. I see them now and then, usually with the help of the birds. This one had a meal in the process of moving through his belly so he certainly had no interest in eating anything else at that time. Snakes don't need to eat daily. For most even a weekly meal is good enough. I was intrigued by how swollen that area of the body was and how it changed the pattern of the skin since it was stretched out. I suppose he could've had a shrew but we have quite a few deer mice, so they do have a variety for dining. Since we used to get deer mice in the garage which created trouble with the cars a few times, we are very grateful to have the snakes. Black Rat Snakes are not aggressive and quite docile actually. Not that I've ever held an adult one. I have not been able to pick up an adult snake unless somebody hands it to me. I do pick up baby snakes though. They are such fun to look at. When we found a baby Northern Water Snake I had never seen one before. 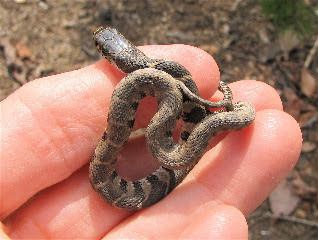 I thought it was a baby King Snake, but after submitting it to a forum, found out what it really was. Then I found out this baby will grow into an adult that can almost always be counted on to bite, defecate and spray a particularly foul-smelling musk when handled. I'd like to learn how to pick up adult snakes, but I'm sure some of the old fear of snakes, that seems to be inbred into most of us, is still present, even though "perfect love casts out fear." I sure do love snakes (at least the nice ones) so I'm on my way. 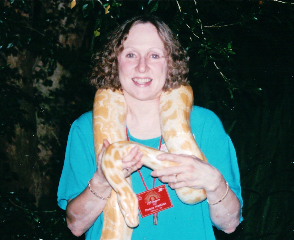 Seeing somebody else handling it totally disarms my fear because I even reached out for a huge Albino Ball Python snake from a man while I was in Singapore. We are still having regular rains so the flowers are blooming so well this year. I grieve for those who are without rain and are already on water restrictions. Water is certainly the basis of all life. The bright pink phlox is blooming on our deck which brings the butterflies and hummingbirds more often. I would have it in the flower beds but the deer enjoy eating it, so I had to put some in pots and enjoy it while I work and play on the screened porch. Even our "deck garden" brings a lot of wildlife to view. You don't need a lot of space to build a backyard wildlife habitat. With blooms comes bugs and I enjoy seeing the creativity of our Lord in all the many designs within the world of insects. We've been seeing the Banded Net-winged Beetle for quite a few years. To me they look like they should be a moth. 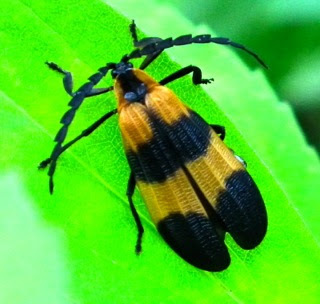 The banded net-winged beetle (Calopteron discrepans) is colorful in black and orange and commonly found resting on vegetation in moist woods throughout much of the eastern United States from New England south to Florida and west to Oklahoma and Kansas. The adults range in length from approximately 3/8-5/8" (10-15 mm). It's speculated that their bright coloration provides a warning to predators that these beetles are not good to eat. Adults are active during the day and they feed on decaying plant material, and occasionally on other insects. The larvae are predaceous and consume a wide range of prey including insects, slugs, sowbugs, and millipedes. Thus, net-winged beetles are considered beneficial insects. I love finding evidence of all the beneficial insects our wildlife habitat has attracted since we don't use chemicals and pesticides. Randal's trip to Oklahoma was a success. He had lots of play time with our son and also did a lot of chores for his parents and he and Ben worked on a few repairs at Ben's house too. 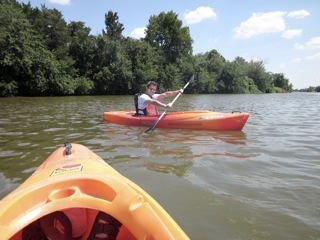 They had a lot of outdoor time and I think the top of the most enjoyed list would include riding bikes, kayaking and geocaching. I enjoyed the time alone, which is easy to do when you know it's not a permanent situation. I sure am used to enjoying life with my honey, so glad he's back home and settled in. We're looking for something different to do for July 4th, but it will depend on the weather. If it's hot, we'll stay tucked away here in our refuge where the temps are 10-12 degrees different than the highs out on the asphalt. As to my health, I did very well while Randal was gone. Didn't need to call the neighbors for any help. I am now up to 3 ten-minute sessions on the rebounder and definitely with more force and energy. I'm also working my arms to get more strength back in them. I did quite a bit of gardening while Randal was gone, so he had plenty of "honey-do piles" around the property. There is not a day that goes by when I am not so very grateful to have all this energy and growing ability to use it. Breathing has FINALLY been much better, so I'm VERY VERY excited about that. The more time I spend meditating on the Word, the more Life and healing develops in me. Proverbs 4:20-22 has great promises in it and it encourages me to dwell on the Word day and night. "My son, give attention to my words; Incline your ear to my sayings. Do not let them depart from your eyes; Keep them in the midst of your heart; For they are life to those who find them, And health to all their flesh." If you can work and play and worry over something day and night, you can meditate on the Word which will bring good things into your life, instead of the fear and apprehension that worry brings. God has given us so much in His Word and the world has provided all kinds of alternatives to it. Do you take God's Word seriously? Do you believe the Word of God? He has given us many guarantees for success in this life if we simply believe God's Word. It's so simple, but yes, it takes work to apply it. The devil will give you many other options for your time. Take time to be outdoors and view all that God has created (overlook what man has messed up). He will show you more of who He is if you tune into what He has made. By observing the universe we can know that its Maker had to be very wise. The Bible is our manual to live life abundantly as Christ wants us to do (John 10:10). Why do we trade it in for a million other things that provide very little, if any, reward?